Church leaders have a responsibility to protect the reputation of the institution of the Church. They are also custodians of a very high moral duty to protect the most vulnerable in their care, including sexual abuse victims. It is a common criticism that they have previously given priority to looking after the reputation of the institution over the needs of sexual abuse victims, who have suffered further as a result. On the other side, many critics are not obviously concerned about the rights of the Church's 'good people' and positive values represented by the institution. It appears they wish to see the needs of victims addressed in isolation. There is goood reason for suggesting the needs of victims are more important than those of the institution, but it is not helpful in the long term to assign priority to one or the other. Because the sexual abuse problem is endemic, the long term common good requires a more wholistic strategy. Last week the Australian Defence Force (ADF) was subject to similar criticism following the release of the damning DLA Piper report into sexual abuse over many years. Just as Catholic Church leaders were accused of harbouring past abusers by not reporting them to the police, media headlines highlighted the DLA Piper report's revelations that 'un-prosecuted rapists' remain in 'senior positions in the armed forces'. This is quite significant because the ADF has always had the capacity to deal with its own through the court martial system, which allow criminal sanction. By comparison, the Church has only been able to inform civil authorities and defrock priest perpetrators. Retired Major General Jim Molan commented at The Drum on Thursday on the 'not inconsequential' issue of the reputation of the ADF. However he insisted that protecting the reputation of the ADF 'must never hamper justice for victims', who are 'the first priority of action'. It is pleasing that he puts the needs of victims ahead of the reputation of the ADF. But it is a flawed strategy to consider reputation and the rights of victims as two unrelated challenges that must be addressed separately. Increasingly it appears that we're talking about a problem that is endemic and not confined to a rogue element. 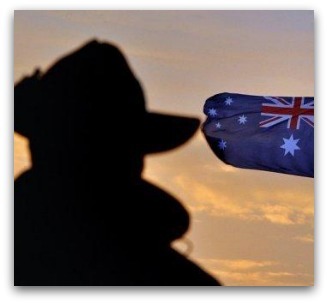 Molan explained that the ADF 'needs to remain the most respected institution in Australia, as it was in a recent survey, to attract people and funds to do its job'. Separately, he argues, it 'can respond empathetically to each individual abuse case without accepting that this puts a stain on all the ADF and all that it does'. Contrary to Molan's argument, we believe that it is necessary for the ADF to accept the 'stain' before it responds empathetically. The very act of accepting the stain will demonstrate the ADF's capacity for strength, honesty and justice in the way that it goes about confronting serious internal issues. This is a much more effective way of ensuring its good reputation for the long term than a slick public relations expertise, which is the common quick fix for reputational damage. A contrite ADF that acts righteously within will always be in a better position to prosecute just wars than an organisation with an apparently good reputation that is founded on hubris or spin. If Molan's views reflect those of the ADF leadership, the Church is ahead of the ADF, in that the Church has moved in recent years towards accepting that the sexual abuse problem is endemic and not merely the result of the behaviour of rogue priests. A major turning point came when Pope Benedict XVI told reporters in 2010 that the problem was 'the sin inside the Church'. Implicitly he was saying that acknowledging the institutional Church's sin — or stain — is the precondition for forgiveness and reparative justice for abuse victims. If — and only if — this attitude filters down to local dioceses, the Church can expect to be able to offer justice to sexual abuse victims, and rebuild its reputation at the same time. A joint lesson for the Church and the ADF. You write “Church leaders have a responsibility to protect the reputation of the institution of the Church.” Compare that sentence with this quote from Richard Holloway’s "Between the Monster and the Saint", page 167. “. . . we must acknowledge that, while there have always been heroic Christians who have followed the way of Jesus, the institution that bears his name has rarely attempted to do so, probably because institutions know intuitively that they are instruments of force. The first rule of institutions is self-preservation, usually at the coast of their original purpose. If the original purpose of Christianity was to carry the spirit of Jesus through history, then it soon fell into the trap of using most of its energies to maintain itself and the life to which it had grown accustomed.” I think I prefer Holloway. There are both similarities, and significant differences, in the crises within the Church and the ADF in relation to sexual abuse scandals. Sexual abuse is sexual abuse whether perpetrated in a church or secular setting. And the impact on victims is just as profound. I think the differences are that the Church hierarchy has, hopefully in the past, regarded itself as 'outside' the realm of answering to any government of a particular country. The injustices within the ADF stem from a culture of misogny and bullying as a part (but not wholly) of an initiation into a type of secular culture. Both attitudes need the strongest condemnation. Another matter - some would call it scandalous - that was not only hidden but, in some States, aided and abetted by the Church over several years, was the existence of the secret organisation without a formal name but referred to as 'The Movement'. It is now clear, from documented evidence, that the ultimate aim of this body was to gain control of the A.L.P. Those Catholics who opposed it at the time - Arthur Calwell was a well-known example - were victimised or criticised, even by priests speaking at Mass. It would be appropriate, even if belated, if some acknowledgment and apology be made to those critics of The Movement. Their stance has been shown to have been well justified. I am a lawyer and I have dealt with 5 sexual assault cases 3 involving Catholic institutions and 2 from other denominations.The catholic response ,on the ground ,has been positive and in each case investigators reports commissioned by the church were handed to us as the victims lawyers.In each report the victims allegations were found by the investigators to be "most likely truthfull". When I then read how three senior priests one of whom is a lawyer have covered up assaults by a fellow priest, I feel Ashamed as both a catholic and a lawyer.Clearly what seems to have occurred is misprision of a felony which is a criminal offense. If the church hierachy will not clean this mess up and it seems to be in no haste to do so then the Court system must act. As catholics we cannot hide behind the church/state dichotomy. Let us hope that somewhere in the hierachy there is a courageous priest who will do what has to be done to keep faith with the victims and "the faithful"
An entrenched, all male hierarchical cultural tradition of child sexual abuse and subsequent public denial of its occurence which facilitates a cyclical subculture of paedophilia is not a "sexual abuse problem", Mr Mullins. It is criminal conduct and conspiracy. The abusers are prurient child rapists, criminals, aided and abetted by their peers and Bishops. The ADF has long been famous for its culture of bastardisation. 'The Church has only been able to inform civil authorities and defrock priest perpetrators'. But it didn't even do that, let alone report and discipline bishops and those in authority who knowingly and deliberately covered up. That what the 'child endangerment' case in the US is about. That's what the criticism of the officers in the ADF is about. An institution, be it the Church or the ADF or the police or whatever, is more likely to protect its own image in the longer term if it owns up publicly as soon as a failure is recognised and spells out what it intends to do to prevent recurrence. Until people are convinced by evidence that both the Church and the ADF have resolved to do that, their respective images will remain tarnished. 'If — and only if — this attitude filters down to local dioceses' suggests that the problem has been resolved further up. But we have yet to see any bishops, let alone Vatican officials, sacked or reported to the civil authorities for covering up. “There is no doubt that the victims of sexual and other abuse in the ADF should be the first priority of action." “If there are others who might still be vulnerable, they should be the next priority, and taking action against perpetrators should then be very high on the agenda." “Each of the abused represents a failure of the ADF to look after its people, and a failure of mateship. The perpetrators of the action are culpable enough, but if there have been cover ups, or condoning of such action, then scrutiny must be especially tough." “But there is another cost to this story, and that is the reputation of the ADF, which is not an inconsequential issue. It must never hamper justice for victims, but it is still important…." This is the first time I have seen sexual abuse described in a Catholic publication as endemic to the Catholic church/ministry. As someone who has written in the public media objecting to the use of endemic in this context, I am appalled that it is used here - twice. That is not a criticism of the writer, because it his his interpretation of the Pope's statements. The word is sometimes used in public discourse as synonymous with "characteristic of" or "widely associated with" and carries the extra aural affinity to "epidemic." Fr Mullins says that "the sexual abuse problem IS endemic" - present tense. Do parents of children in schools in which Brothers and priests work know this? See the dictionary definition to appreciate what you have written. That the Pope would regard sexual abuse by people vowed to celibacy as a stain on the church and still insist on celibacy is the ultimate contradiction; little wonder it is a staple of standup comedy. Changing the celibacy rule will not end sexual abuse, of course it won't, but it will most certainly reduce its occurrence. And I still think sexual abuse is a problem with individuals, not with the institution. Frank, sexual abuse may, as you say, be 'a problem with individuals, not with the institution', but the cover-up is not. Cover-ups of this type require complicity among several people in positions of power to be silent accessories after the fact. This is what Paul is driving at when he calls the cover-ups 'misprision of a felony' which, as he points out, is a criminal offence. That is why the recent 'child endangerment' case in the US is so significant - for the first time ever the criminal nature of the institutionally sanctioned cover-ups has been recognised for what it is. As usual, debate degrades to a nitpicking exercise in semantics. As the victims of sexual abuses and their families if they feel "endemic" is the correct description and I'm sure they won't be bothered trying to fathom the best word to describe it. I have followed the three Irish Inquiries and been peripherally involved in the Deaths in Custody and Stolen Generation Inquiries I see as real the danger of re abuse of the abused and their lack of protections and in my terms seen thru the eyes of the Khmer Peoples that I have been among for eleven years and who have had countless UN, AusAID, NGO, Government investigations and now the Khmer Rouge Trials that only to produce NATO reports - No Action Talk Only. The http://www.theage.com.au/opinion/-2242w.html and the Sunday Age editorial reinforce my changed view. I still believe in our group for the innocents (fti) and our apology and I applaud those In Good Faith to support victim survivors innocents and applaud COIN for its specialized legal insights and I applaud fti in its the tenacity to involve priests via the National Council of Priests of Australia that I had a part in initiation and to involve the remnants in the parishes. Clergy sexual abuse is the critical religious issue and should not be diminished by paralleling it with the ADF scandal. I agree with Barry G. The reputation of the Church has no intrinsic value in itself which would give the Church reason to protect it. Its reputation, what people think of the Church, depends entirely on whether it lives up to the ideals of its founder, Jesus, in this context to heal the wounds of those who have suffered at the hands of clergy. Too often now in the case of those sexually abused by clergy have we seen the Church as paying less attention to the victims than is necessary, having regard to the extent of their continued suffering.